When you blow the whistle on your own profession, bad things may happen. Brad Katsuyama blew the whistle on not only his fellow financial traders, but also on the entire system of buying and selling stocks. He\'s been pilloried by some of his former colleagues, but he persistsâ€”not to make money, not to gain fame, but to right what he perceived as a serious wrong. Katsuyama worked on Wall Street for the Royal Bank of Canada, trading stocks and eventually running the bank\'s equity-trading group. He was an up-and-comer, highly valued and commensurately paid by his employer. But he was seeing something that troubled him: When anyone on his team placed a large stock order, it wouldnâ€™t be completely filled right away; when it was filled, heâ€™d have to pay a higher price than he had been offered moments before. Katsuyama investigated and discovered the reason for the higher price: Traders operating on computers far faster than his bankâ€™s would intercept the transaction, buy the shares he was trying to order, and then re-sell them to his team at higher prices. It was all done in milliseconds, but it was costing his clients a bundle. Katsuyama knew that this wasnâ€™t fair to investors, but a great deal of money was being made by the traders who had rigged the system. They were powerful and crossing them could sink his rising career. The safest thing to do would be to just keep quiet about what heâ€™d discovered. The profitable thing would be to get in on the system and join them in ripping off investors. Or he could stand up for what he knew was right. He gave up his high-paying job, pooled his savings with a colleague who had joined him, and started a new stock trading system, the IEX Exchange. IEX guarantees that all orders arrive at all the exchanges at the same time; the high-speed operators cannot get that millisecond advantage theyâ€™ve been using to make vast fortunes. Others have come to his defense. IEX is processing trades for companies and private investors who want a fair shake. And IEX has received hundreds of resumes from people who want to work in an ethical company. Itâ€™s also received whistleblower accounts from inside other trading companies. As for the guy who figured out what was going on, Katsuyama would like to downplay all the personal publicity and he doesnâ€™t agree with critics who say computer trades should be stopped. â€œWeâ€™re not against computerized trading,â€ he says. But he does want transparency, and that level playing field for all investors. 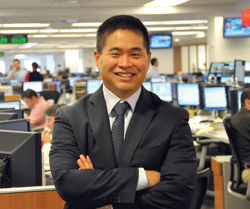 â€œChanging the way the market operates is better for everyone,â€ says Brad Katsuyama.